It's summer time once again and it's making itself felt with this heat wave! Retreating to the beach for the next few months is a great idea but not really practical and friendly to the wallet. How about day trip recommendations instead? There's a new playground in town! Albert Einstein said that play is the highest form of research and we take that philosophy to heart. Case in point -- the husband and I took the kids to the biggest floating water park in Asia and their biggest take away from this experience is that strengthening their core is an important aspect of exercise! Haha! It's a balancing act out there especially if it's a windy day. Just watch Talia and Erin fall and crawl and struggle through this playground. I didn't get to try this myself as the sun was too scorching hot for me but the kids tried it for an hour and they had a blast! 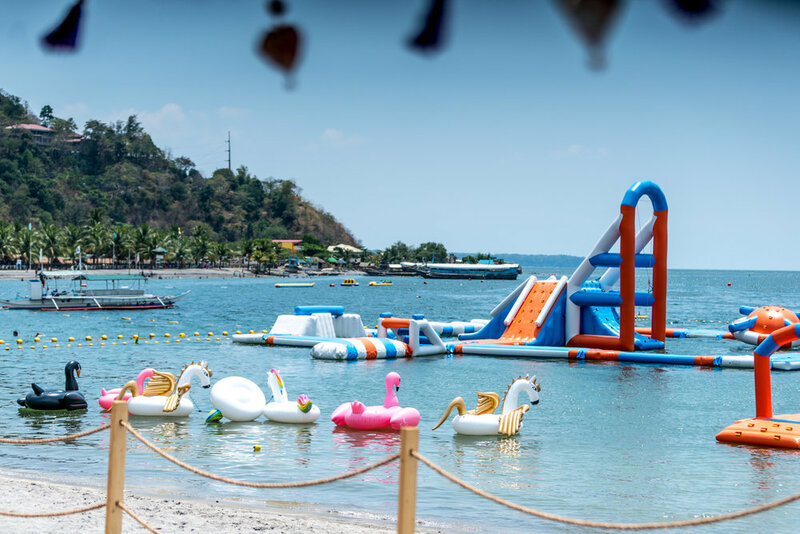 Inflatable Island is a new attraction in Subic (about 2 - 3 hours away from Manila) and it's perfect for kids (at least 3 feet tall) and adults alike. 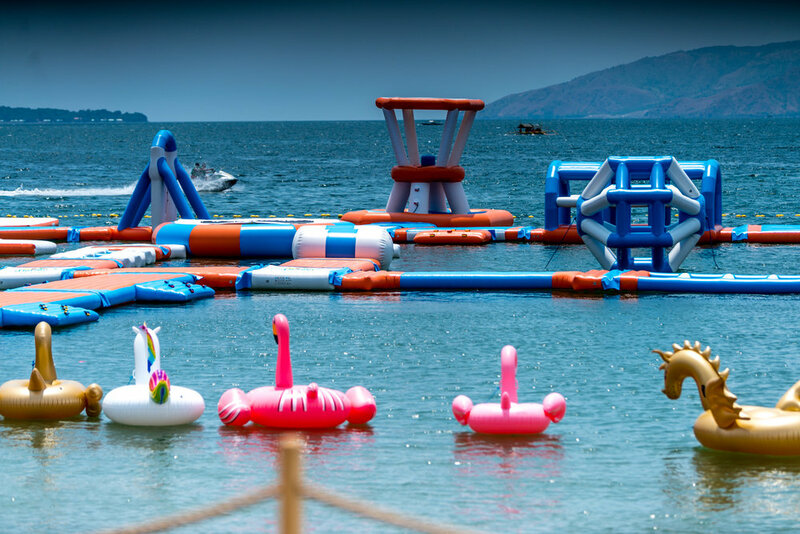 This is definitely for those who are up for a challenging visit to the beach as balancing on the inflatables is just the tip of the iceberg. Obstacles such as monkey bars, swings and wobbly bridges will keep you on your toes (or knees) all throughout your water park experience. Tip #1: Wear rash guards and leggings. I thought shorts would cut it but if you end up on your knees, the inflatables will be a bit rough on the skin. My job for the day was to guard our belongings at the lounge area while the kids were busy playing (lockers will be available when they open on April 1, 2017). This Balinese themed lounge is gorgeous! I'd love to have playdates here -- let the kids run free at the floating park (although smaller kids need an adult with them) while us parents chat, drink (lots of it, please) and eat at the lounge. Tip #2: Load up on the sunblock! Tip #3: Book online to get 10% discount and to ensure that you get a slot on your desired day. As of writing this post, the island is almost fully booked when they open on April 1, 2017. Tip #4: Make sure you arrive at least 30 minutes before your designated time slot for their orientation. Tip #5: Don't be shy to ask the lifeguards to help you. They'll be the ones pulling you out of the water anyway in case you fall into the water. The kids said the lifeguards are so friendly and encourage rough (but still safe) play. Check out the last clip of the video above, the lifeguards were the ones playing bumper floaters with Talia and Erin. I've been to Bulacan only once prior to this trip and my memories of it are of heritage houses and large statues of saints. I also associate the place with Nana Meng Tsokolate and Sevilla Sweets, popular brands hailing from Bulacan. I've always wanted to explore the place more, but we never really got around to it until earlier this year. Thanks to Ava Javellana-Solon, I was introduced to this hidden treasure in San Rafael, Bulacan. Just an hour and a half away from Makati, San Rafael River Adventure is another great option for a day trip. My family gets claustrophobic in the city, so we need to get away even just for a day for some fresh air. The resort offers glamping packages and even a glass villa but since this was a last minute trip for us, we just got the day trip package. Cost of this trip for 3 adults and 2 kids was approximately Php 5,000 (about USD 99) which already includes the entrance fee, use of a cottage, infinity pool, lunch, snacks, gas and toll! We try to teach our kids to spend money on experiences and not on things. What we spent for this day trip would be equivalent to just 2-3 three toys which could end up buried in their pile of toys in their playroom after a few weeks. We always try to keep in mind that it's better to collect memories (and photos) rather than things! Tip #1: Make sure to pre-order your meals as it takes them a while to prepare it. If you plan on joining the river cruise during lunch, this has to be pre-booked (no walk-ins). Tip #2: No corkage fee so bring lots of food and drinks! Tip #3: A day tour comes with your own cottage but if you plan to just hang out there, that's not a good idea. You'll barely see anything from that side. Thankfully, the terrace area was unoccupied so we ended up staying there instead. As the name implies, this is a resort where you can have a bunch of different adventures. Go kayaking, wake boarding, horseback riding and more. Or, you can do it our way and just spend the day being pool bums. When we went we just really needed to recharge and be one with nature. Thank you to Subaru Philippines for being part of our Bulacan road trip. Article about the Subaru STI is now up on OpusMacchina.com. How about some water therapy with real health benefits ? They say hot springs are good for the tired body and we agree. There's nothing like soaking your body in water heated by subterranean volcanic activity. Health benefits include boosting of blood circulation and the immune system - more reasons for us to say yes to this day trip. Laguna has a lot of homes built or converted to small resorts for rent. Just drive along the main roads and you'll see men holding up signs for private resorts for rent. We're impulsive travelers and we were able to book a house the night before our trip via this site. You can book just for the day but if you want a longer vacation, these houses are up for rent for 22 hours as well. Tip #1: Buy floaters from any of the vendors along the main roads. Price can go as low as Php 50 (about USD 1) for a small one. Tip #2: Bring your own food and drinks, or if you're too lazy to cook, just order from the various food chains within the area and have stuff delivered. Tip #3: Depending on where exactly you'll be, check if there's Mernel's nearby. Their chocolate cake is one of my must buy food items whenever in Laguna. Tip #4: Buy malunggay pandesal (moringa bread roll) for breakfast - or merienda. Sounds weird but it's really an amazing twist to an already delicious bread roll. Forecast states that we may hit 35C this coming weekend. How about a daycation in any of the above places then? Workaholic and multitasking momma who absolutely enjoys what she does as Executive Producer for OTT. Has faulty memory so taking photos of almost everything is part of her everyday life. Clark and Subic are former US military bases in the northern island of Luzon, Philippines. These places are now among Asia's emerging tourist destinations. We end 2016 by being part of a wonderful initiative headed by The Lighthouse Marina Resort Legacy Foundation. Sampaloc Cove in Zambales is home to several indigenous families and we were part of this year's Lighthouse tradition of sharing blessings with the community. Santa Rosa, Laguna is predominantly a residential community located in southern Manila. The Nuvali area in Sta. 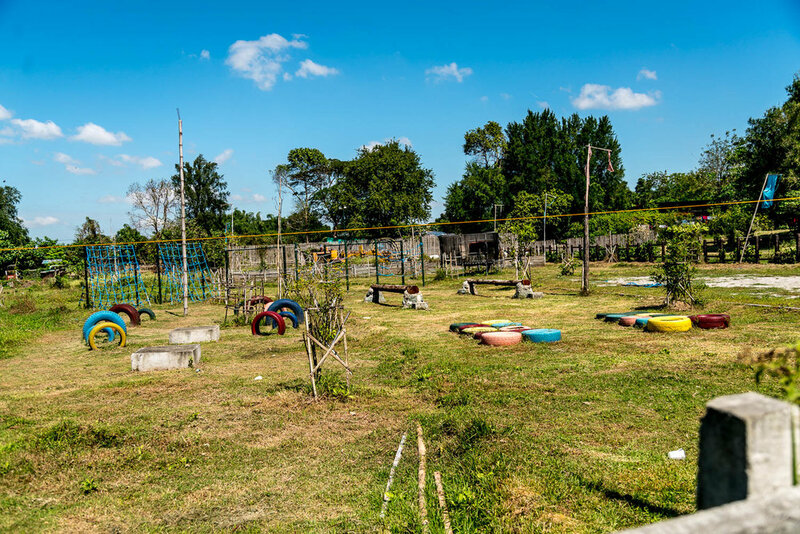 Rosa is popular for their recreational complex which offers paths for leisure biking, off road trails for mountain biking, a water sports facility for wake boarding, a huge pond for koi feeding, and more. Laguna is the birthplace of our country's national hero, Jose Rizal. It is famous for several attractions like the hot spring resorts in Calamba and Los Baños, the Taytay Falls in Majayjay, the footwear from Liliw, among others. Located in the Central Visayas region of the Philippines, Bohol is known for its beaches, coral reefs and unusual geological formations such as the Chocolate Hills.